African Sapphire Villa - Can sleep 16 guests in 8 bedrooms. Russian Amethyst Villa - Can sleep 10 guests in 5 bedrooms. Brazilian Emerald villa - Can sleep 10 guests in 5 bedrooms. Altamer resort is on the island of Anguilla in the Caribbean. The easiest way to get here is to fly directly into Anguilla airport. Or alternatively, you could fly via St Maarten and then it is a 20 minute boat ride across to Anguilla. 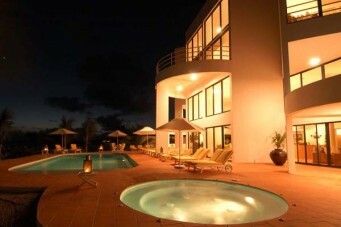 Altamer Resort is located on the Caribbean Sea on the secluded island of Anguilla. The environment, service and cuisine will exceed all of your expectations. There are three types of luxury villas to choose from – Russian Amethyst Villa, Brazilian Emerald Villa and African Sapphire Villa. Each villa comes with its own private swimming pool, hot tub, fitness center, personal butler with 8 other dedicated staff (chef available if meal plan selected), home theater, state of the art villa sound system, elevator, in villa office with high speed internet connection and wireless access, Caribbean breakfast (fruit, assortment of breads, cereal), cocktail hour canapés, selected beverages (mineral water, coffee, tea). There are 2 tennis courts, with basketball hoops, and 1 volleyball court for the three villas. of luxury villas to choose from. There are plenty of activities at both Altamer Resort and on Anguilla and the surrounding islands. In Altamer you can choose from tennis, scuba program, snorkelling, beach volleyball, badminton, and aqua aerobics. Or perhaps you would like to adventure out a little bit and try a boat and picnic trip to a near by island. Or try sailing on an Anguillan Sail Boat!